What Does A Watch Winder Do, And What Else Can They Offer? Mariner, also called anchor, link chains are one of the most popular styles among men and women nowadays. Inspired by a free spirit of seaman, the mariner chains are designed like no other necklaces. Consisting of oval-shaped links with bars through the center, they can be absolutely flat or visually puffed. The last type became widely popular from mid 2000s when a few famous hip hop artist worn these chains in their music videos and appeared on the magazine covers showing off with the stuff. These types are amazing accessories that make a striking statement while wearing alone. Or they can be ideally matched up with an exquisite pendant for a complete look! 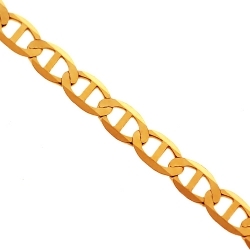 Our selection of chains are guaranteed to be made of real gold including 10k and 14k purity of yellow, rose or white colors. They are secured with the safest and user-friendly lobster claw clasp. Select a stylish piece of jewelry to dress up your everyday look and become the center of attention!